The Mikrolab dual preamplifier is another unit built for instrument and microphone level inputs. The circuit is essentially similar to that of the Bewag preamplifier. 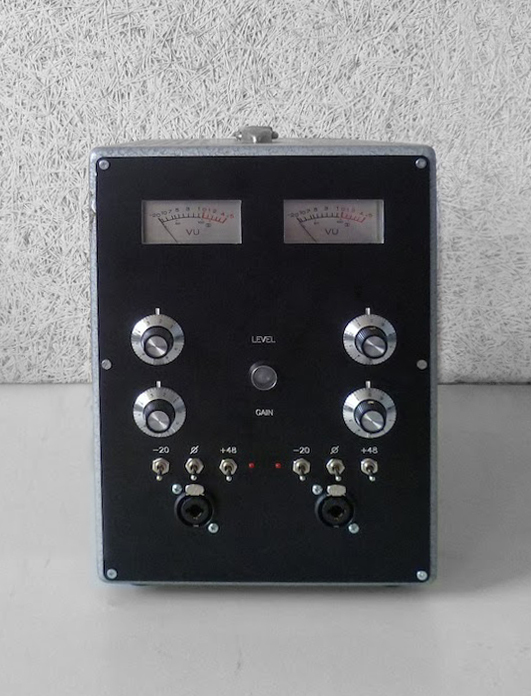 Of course, this one takes the look a little bit closer to the laboratory and has a separate VU meter per channel. In all, this was perhaps the perfect case for this type of project as changes to the unit’s structure weren’t needed. All the usual suspects of pad, phase and phantom power are present as well as having transformer balanced in and outputs. As the unit was sent to Ireland, it received the superior kettle plug!